Nashville, TN -- Bluegrass Unlimited Magazine (BU) readers will find the iconic Ricky Skaggs gracing the cover of the June 2013 edition of the national publication. Skaggs recently spent some time with BU's Bill Conger to chat all about his 50+ years of making music and his most recent release, Music To My Ears (Skaggs Family Records). The June 2013 edition of BU, featuring Skaggs, is available on newsstands now. Nova Scotia, Canada -- The Spinney Brothers, "Canada's International Bluegrass Band," are proud to announce that Memories, the first single from their latest Mountain Fever Records CD of the same title, has reached #1 on Bluegrass Unlimited's Top 30 Songs chart for February. This is the band's first time in the top spot of the National Bluegrass Survey. In addition, the complete project has moved up to #3 on Bluegrass Unlimited's Top 15 Albums chart. Nashville, TN -- Nu-Blu’s thought provoking new single, “Martha and Mary” made its debut this month on the Bluegrass Unlimited Magazine's Top 30 Songs chart. The song appears on Nu-Blu’s Nail by Nail album on Pinecastle Records. “One of the best tracks on the album is Martha and Mary, a powerful, banjo-driven tune written by Becky Buller and Nancy Cardwell... It’s the kind of song that you can’t help listening to without nodding your head in agreement… in rhythm,” says Parchbench in a recent review. 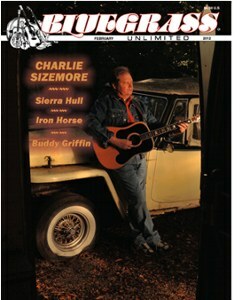 Charlie Sizemore is featured on the cover of the February 2012 issue of Bluegrass Unlimited Magazine that includes a rare interview with the acclaimed, singer-songwriter. Sizemore uncharacteristically opens up about his music, his career as a lawyer, his hit album Heartache Looking for a Home, and single "No Lawyers in Heaven."